Temperature is a crucial factor in aquaculture. Both low and high temperatures hamper the fish physiology and water quality as well as fish culture. Moreover low or high temperature especially, low causes high growth performance and effectiveness of some pathogens. These affect the fish in a great extent- sometimes cause death ultimately. However increase or decrease in temperature is a natural phenomenon. But, now-a-days, due to global climate change, various environmental anomalies are facing by the inland water body of Bangladesh. In the last decade, Bangladesh has faced many times abrupt temperature fall and higher temperature in winter and summer respectively which did not match with the normal environmental phenomena. As the country geographically located in the tropical temperate region, therefore, the flora and fauna of here are not able to easily survive in such abnormalities of environment. Such type environmental shocks resulting various disease and massive death of living entity. Though these environmental abnormalities cause different diseases in plants and animals, our study noticed a different type of eye disease in freshwater Catla species (Catla catla) which is not aforementioned in another study of Bangladesh. However, this Epidemical eye disease is previously affected the Catla fish in adjacent countries which is mentioned in literature. But it is a new threat concern in Bangladesh (Bagum et al, 2013). Scientifically, this eye disease of C. catla is termed as “Exophthalmia” (Gopalakrishnan, 1961). 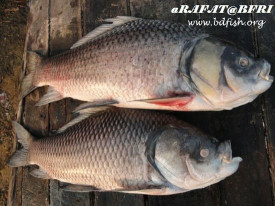 From the review of literatures, it is found that, it occurs only in big sized Catla (4-6 kg or above) in winter season when the temperature of water body abruptly falls and continuing. But the disease massively affects the fish when the water temperature reaches into 18- 240C (Gopalakrishnan, 1961). In Exophthalmia, the Catla only affected in the eye region (Gopalakrishnan, 1961). First, the blood cells of eye become dense turned into reddish color and protruded. Later the pathogen affects the nervous system of eye and gradually the eye become pale. 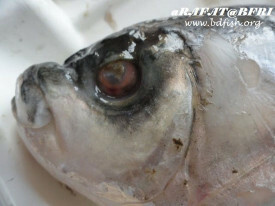 After that, the eye become spoil and the fish become blind. Then the eye disconnected from the eye ball. In the meantime, the pathogen damages the central nervous system (CNS) and finally the fish dies (Bagum et al, 2013). 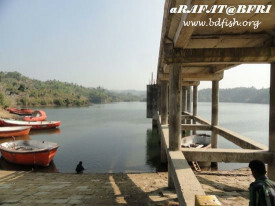 In the month of January, 2013 a study was conducted by a team of scientists of BFRI in the ‘Mohamaya Lake’ at Mirshorai upazilla in Chittagong district. The lake has an area of about 1,100 hectors. 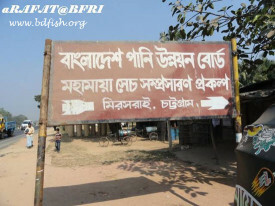 It is the second largest manmade lake of Bangladesh which managed under the supervision of the Upazilla Fisheries Office of Mirshorai. Every year, the government of Bangladesh inputs huge amount of money and materials in this lake. 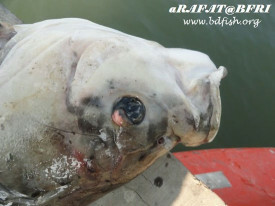 But sudden in the month of later December, 2012 they noticed huge amount of death in large sized Catla fish (4-6kg or above) by affecting an unknown eye disease (Bagum et al, 2013). After a series of study, the scientists of BFRI suggested some control measures against this Exophthalmia disease. But it is a matter of concern that the lake is a vast water body. Thus, the management and treatment was not fully effective and authority failed to take suggested control measures and apply the drugs properly. 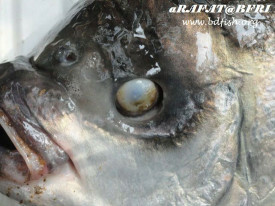 Though the control measures may cure from the disease but it is suggested that, proper management and preventive measures should be taken to save the Catla fish from Exophthalmia and, it is more effective. Because, in aquaculture, practically after the 50% disease occurrence, treatments may fall into failure and mass loss of production may happen (Bagum et al, 2013). Therefore, the farmers of Bangladesh should well manage their water body scientifically and produce disease free fish without any risk. At the last, ‘prevention is better than cure’- these words should kept in mind and followed. Visited 1,386 times, 1 visits today | Have any fisheries relevant question?